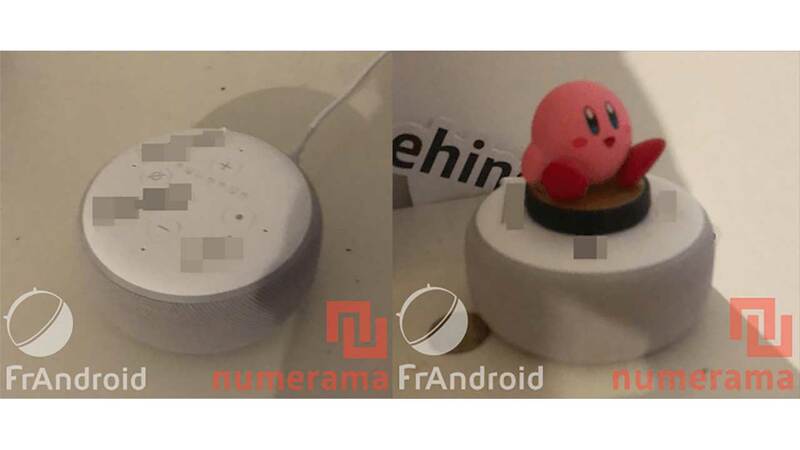 Amazon appears to have some Google Home Mini envy judging by this first purported leak of the retail giant’s next Amazon Echo Dot through French outlets Numerama and FrAndroid. Naturally, the photos are impossibly blurry, which is enough to immediately give pause. However, markedly accurate Amazon product leak blog AFTVNews has verified the photos as well, claiming confidence that they’re the real deal. Both of the French outlets have cited the codename ‘Donut’ for the product, likely speaking to anonymous sources. The photos (rather poorly) depict a speaker that appears to be a bit larger than the 2nd generation Amazon Echo Dot, using an adorable Kirby amiibo toy for scale. The speaker appears to contain all of the same buttons and controls as before, albeit with five microphones to the current model’s seven. The speaker looks smaller than before, but these French outlets say otherwise. But, the most important takeaway here is that the device is now wrapped in a sheet of mesh fabric, much like the Google Home Mini speaker. While it’s currently unknown why the new Echo Dot has adopted this design beyond catching up to the original Amazon Echo redesign, fabric mesh is an incredibly popular covering for speaker drivers. Perhaps Amazon has upgraded the 360-degree audio capabilities of the product, as FrAndroid’s sources claim. Sadly, there’s no more information regarding the product from this purported leak but, given that the device is supposedly already in the hands of employees or testers, we can’t be that far off from a release.